Acrylic on canvas, 72 x 120 inches (182.9 x 304.8 cm). 2 panels, 72 x 60 inches (182.9 x 152.4 cm) each. 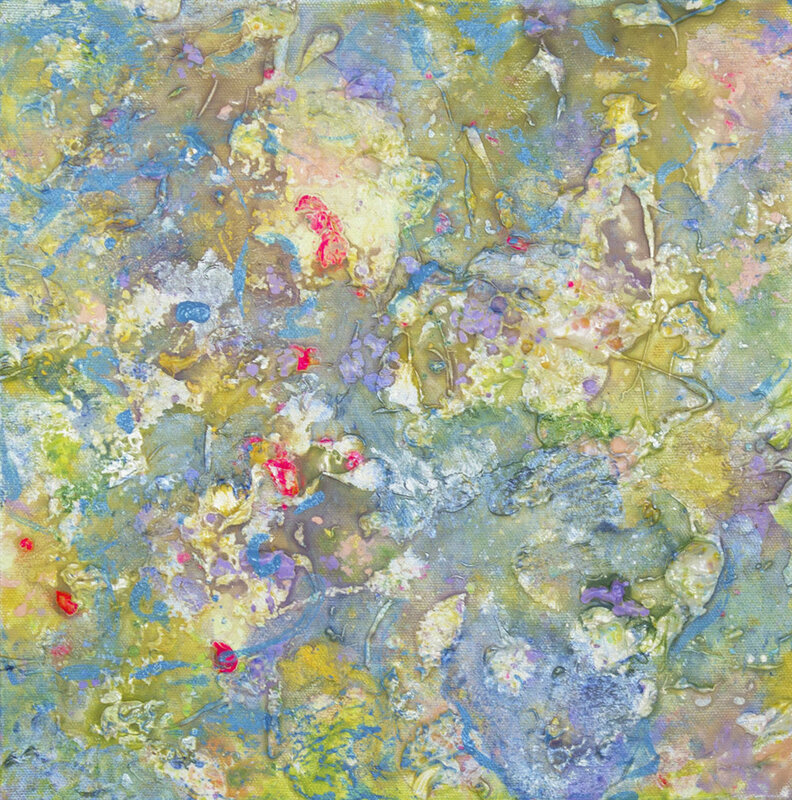 Framed: 74 x 122 inches (188.0 x 309.9 cm). Abstract Landscape Series. Acrylic on canvas, 72 x 60 inches (182.9 x 152.4 cm). Framed: 74 x 62 inches (188.0 x 157.5 cm). Swirl Series. Acrylic on canvas, 72 x 60 inches (182.9 x 152.4 cm). Framed: 74 x 62 inches (188.0 x 157.5 cm). Abstract Landscape Series. 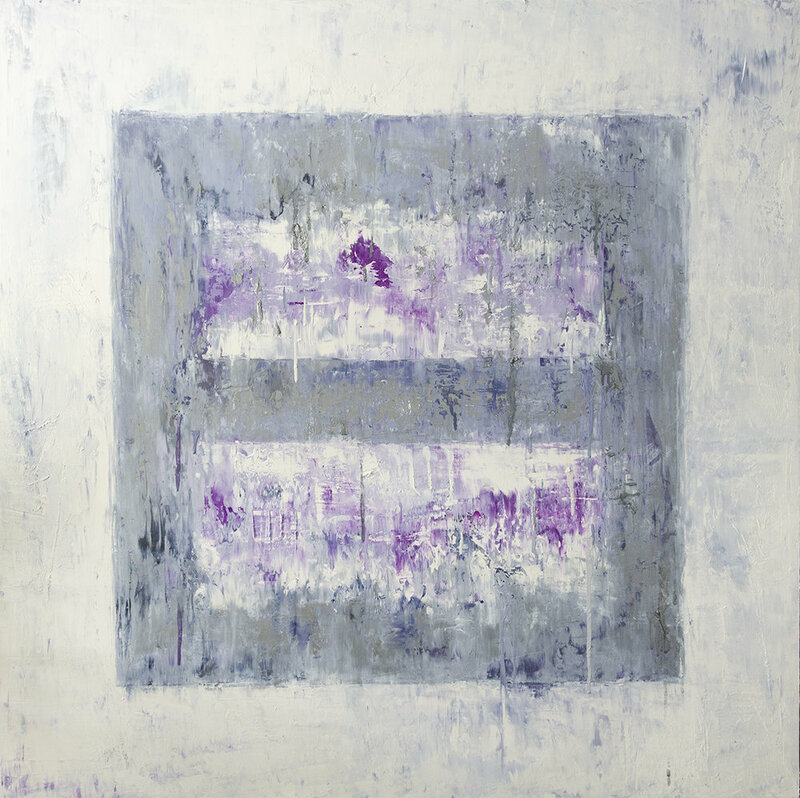 Acrylic on canvas, 84 x 96 inches (213.4 x 243.8 cm). 2 panels, 84 x 48 inches (213.4 x 121.9 cm) each. Framed: 86 x 98 inches (218.5 x 248.9 cm). Swirl Series. Oil on canvas, 36 x 24 inches (91.4 x 61.0 cm). Framed: 38 x 26 inches (96.5 x 66.0 cm). Abstract Landscape Series. Acrylic on canvas, 48 x 72 inches (121.9 x 182.9 cm). Framed: 50 x 74 inches (127.0 x 188.0 cm). Aurora Borealis Series. Acrylic on canvas, 72 x 60 inches (182.9 x 152.4 cm). Framed: 74 x 62 inches (188.0 x 157.5 cm). Swirl Series. Private collection. Oil on canvas, 30 x 30 inches (76.2 x 76.2 cm). Ice Cube Series. Acrylic on canvas, 36 x 48 inches (91.4 x 121.9 cm). Swirl Series. Private collection. Acrylic on canvas, 12 x 12 inches (30.5 x 30.5 cm). Private collection. Shangri La Series. Acrylic on canvas, 30 x 60 inches (76.2 x 152.4 cm). 2 panels, 30 x 30 inches (76.2 x 76.2 cm). Shangri La Series. Acrylic on canvas, 48 x 72 inches (121.9 x 182.9 cm). Framed: 50 x 74 inches (127.0 x 188.0 cm). Swirl Series. Acrylic on canvas, 40 x 30 inches (101.6 x 76.2 cm). Framed: 42 x 32 inches (106.7 x 81.3 cm). Abstract Landscape Series. Acrylic on canvas, 72 x 48 inches (182.9 x 121.9 cm). Private collection. Swirl Series. Private collection. Oil on canvas, 40 x 30 inches (76.2 x 101.6 cm). Framed: 42 x 32 inches (106.7 x 81.3 cm). Abstract Landscape Series. Private collection. Acrylic on canvas, 40 x 30 inches (101.6 x 76.2 cm). Framed: 42 x 32 inches (106.7 x 81.3 cm). Private collection. Acrylic on canvas, 72 x 48 inches (182.9 x 121.9 cm). 2 panels, 36 x 48 inches (91.4 x 121.9 cm) each. Framed: 74 x 50 inches (188.0 x 127.0 cm). Ice Cube Series. Oil on canvas, 40 x 40 inches (101.6 x 101.6 cm). 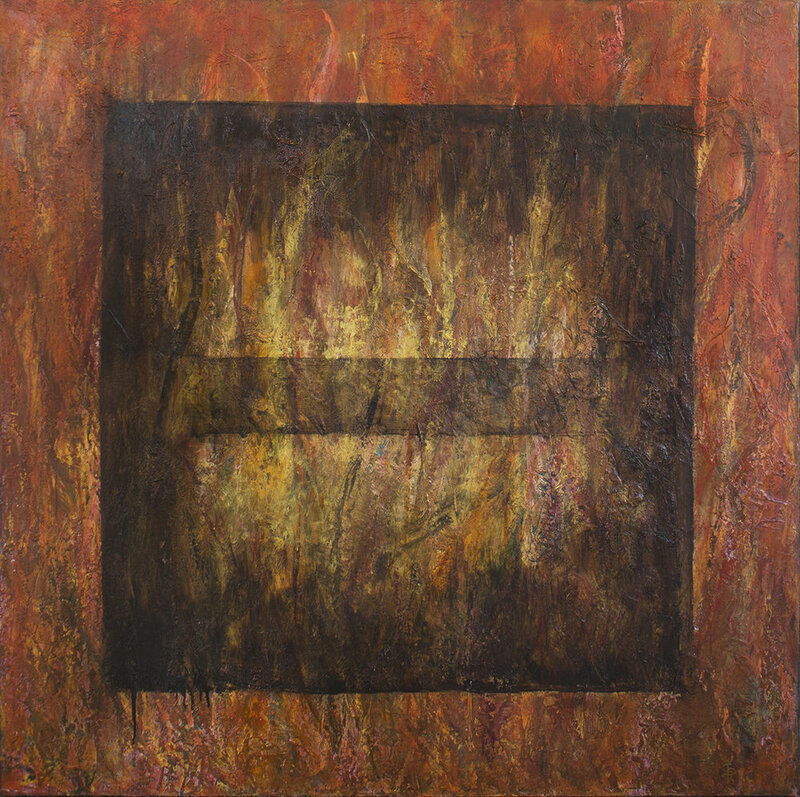 Framed: 42 x 42 inches (106.7 x 106.7 cm). Dreamscape Series. Acrylic on canvas, 48 x 72 inches (121.9 x 182.9 cm). Framed: 50 x 74 inches (127.0 x 188.0 cm). Dreamscape Series. Acrylic on canvas, 30 x 30 inches (76.2 x 76.2 cm). Framed: 32 x 32 inches (81.3 x 81.3 cm) each. Shangri La Series. 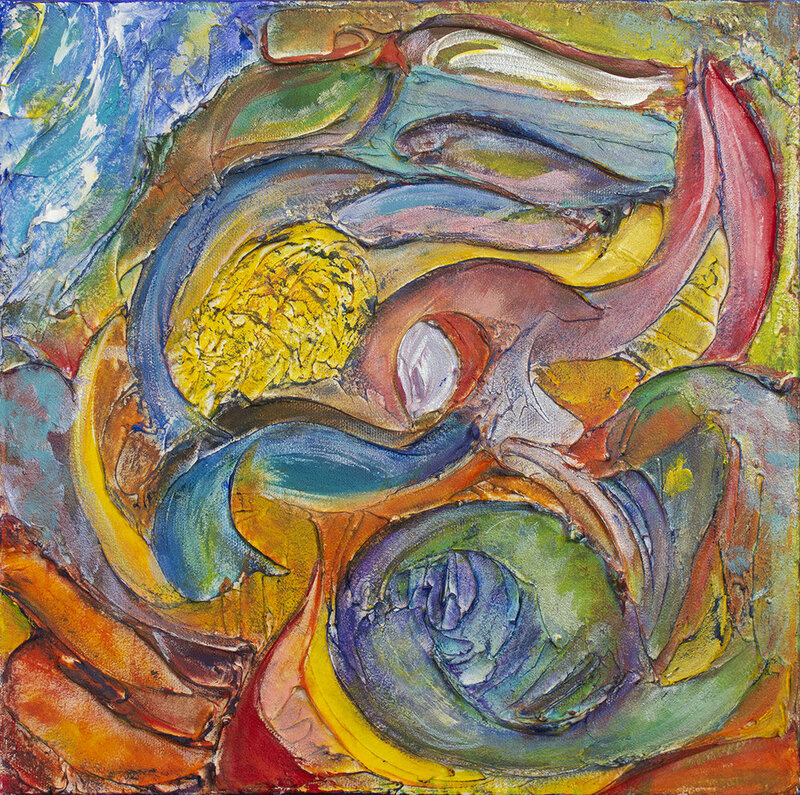 Oil on canvas, 36 x 36 inches (91.4 x 91.4 cm). Ice Cube Series. Private collection. Oil on canvas, 40 x 30 inches (76.2 x 101.6 cm). Framed: 42 x 32 inches (106.7 x 81.3 cm). Geometric Series. Private collection. Acrylic on canvas, 60 x 96 inches (152.4 x 243.8 cm). 2 panels, 60 x 48 inches (152.4 x 121.9 cm) each. Framed: 62 x 98 inches (157.5 x 248.9 cm). Abstract Landscape Series. 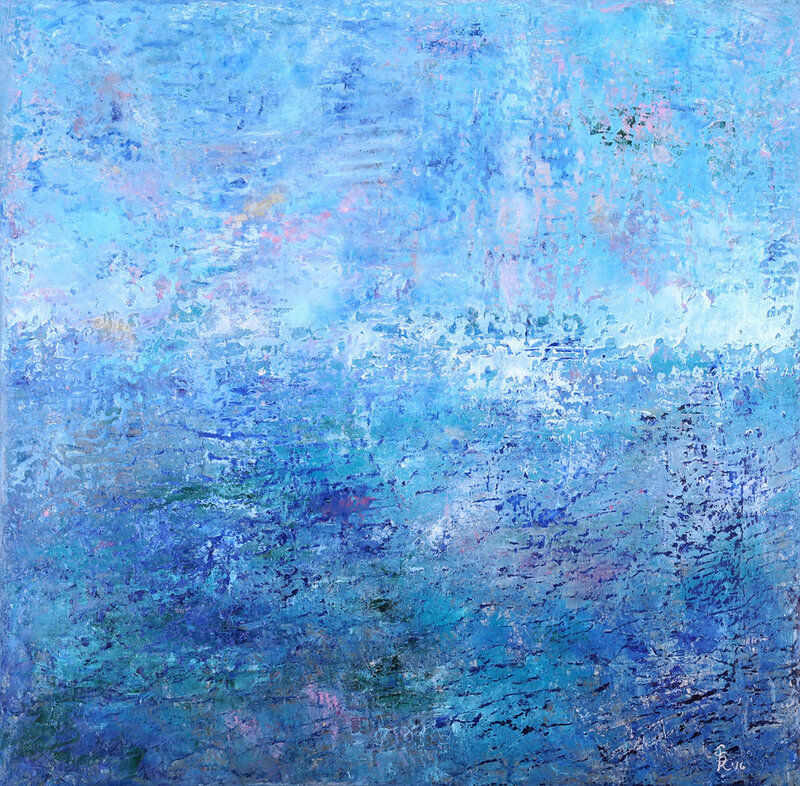 Acrylic on canvas, 48 x 108 inches (121.9 x 274.3 cm). 3 panels, 48 x 36 inches (121.9 x 91.4 cm) each. Shangri la Series. Acrylic on canvas, 48 x 72 inches (121.9 x 182.9 cm). 2 panels, 48 x 36 inches (121.9 x 91.4 cm) each. Framed: 50 x 74 inches (127.0 x 188.0 cm). Dreamscape Series. 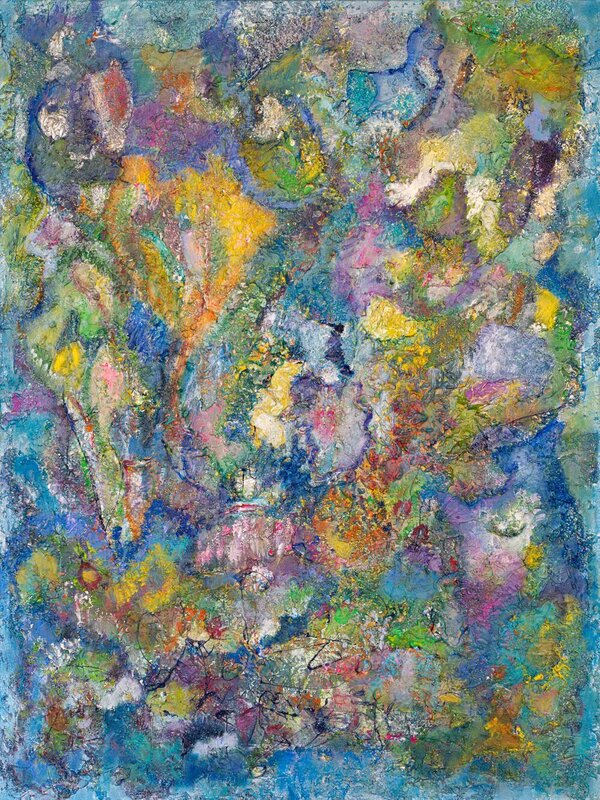 (101.6 x 101.6 cm). Private collection. Ice Cube Series. 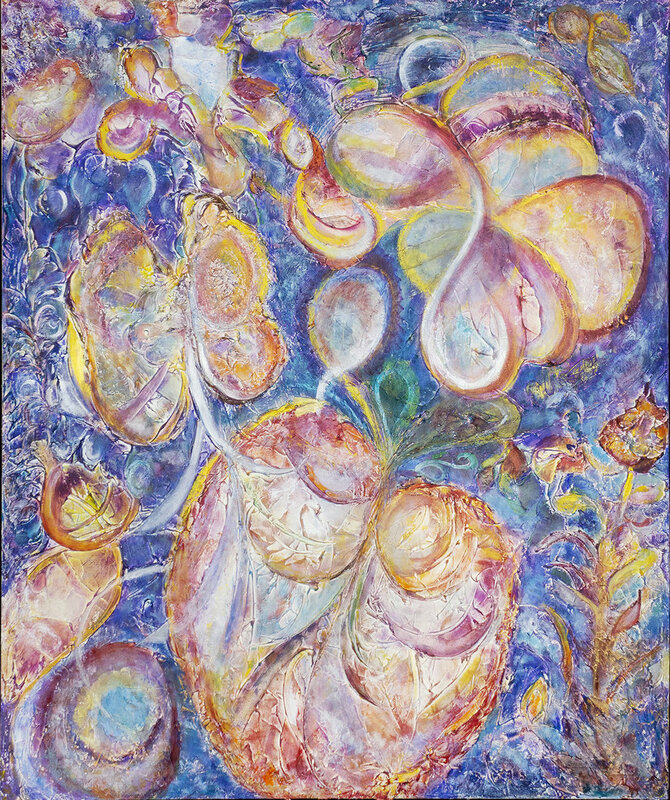 Oil on canvas, 48 x 36 inches (121.9 x 91.4 cm). Framed: 50 x 38 inches (127.0 x 96.5 cm). Geometric Series. (101.6 x 101.6 cm). Ice Cube Series. (157.5 x 248.9 cm). Aurora Borealis Series. Acrylic on canvas, 48 x 72 inches (121.9 x 182.9 cm). 2 panels, 48 x 36 inches (121.9 x 91.4 cm) each. Framed: 50 x 74 inches (127.0 x 188.0 cm). Shangri la Series. (91.4 x 91.4 cm). Private collection. Abstract Landscape. Oil on canvas, 40 x 30 inches (76.2 x 101.6 cm). Private collection. Abstract Landscape. 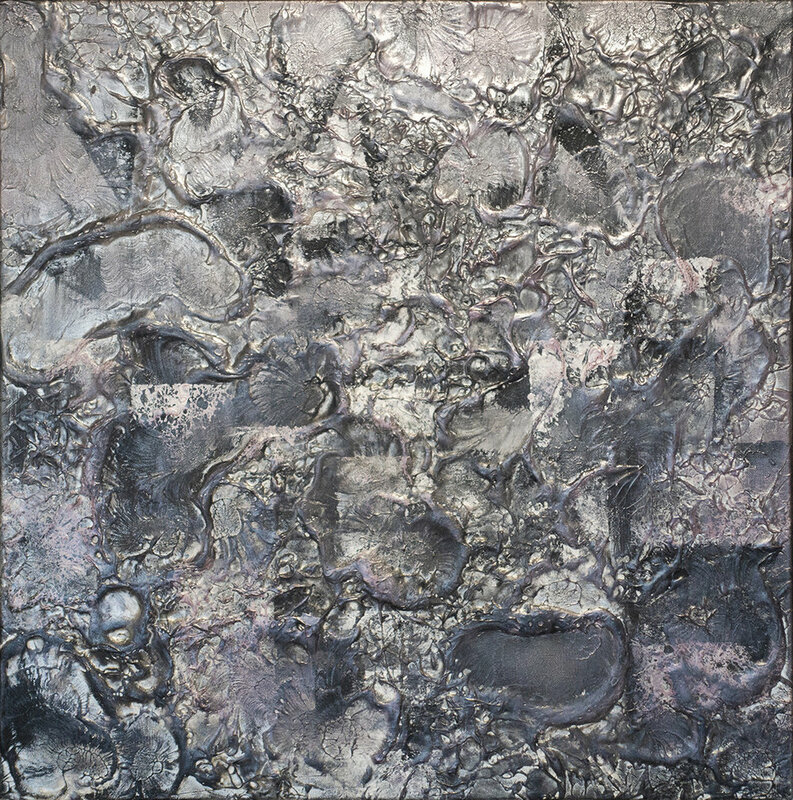 (101.6 x 101.6 cm). Shangri la Series. Acrylic on canvas, 60 x 96 inches (152.4 x 243.8 cm). 2 panels, 60 x 48 inches (152.4 x 121.9 cm) each. Private collection. (121.9 x 91.4 cm). Ice Cube Series. Oil on canvas, 48 x 36 inches (121.9 x 91.4 cm). 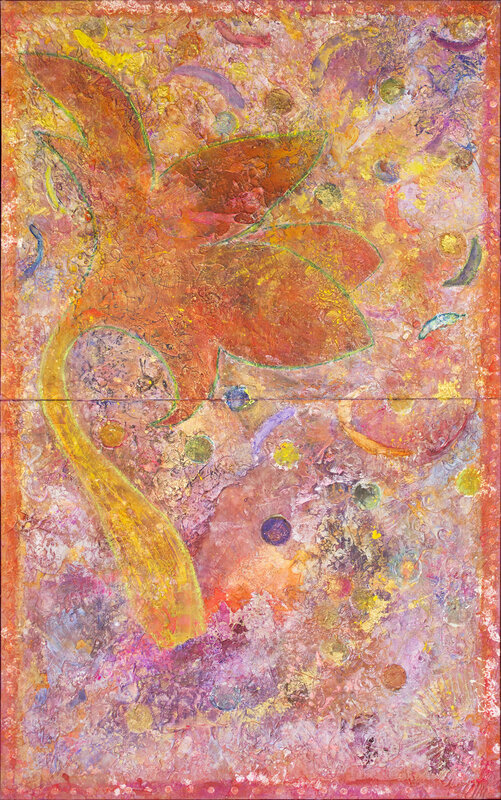 Three panels, 48 x 12 inches (121.9 x 30.5 cm) each. Abstract Landscape. Acrylic on canvas, 12 x 12 inches (30.5 x 30.5 cm). Framed: 14 x 38.5 inches (35.6 x 97.8 cm). Swirl Series. Shop Lollipop 1, 2, 3. Acrylic on canvas, 24 x 18 inches (61.0 x 45.7 cm). Framed: 25.5 x 19.5 inches (64.8 x 116.1 cm). Dreamscape Series.